Filterxchange operates a regular commercial kitchen filter cleaning service. The service can assist premises in meeting their general maintenance, insurance and environmental health requirements. The establishment of a regular filter cleaning service cycle is normally site specific. 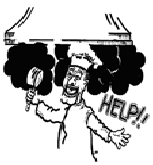 In the case of commercial kitchen canopy filters the volume and type of cooking will impact on the servicing cycle. Premises with charcoal grills or woks require a more frequent service to maintain the filters to their legal requirements. The air-conditioning filter cleaning cycle will depend on the environmental situation and the setup of the system generally. Systems setup with the air return located close to other extraction equipment or drawing supply air from the ceiling space will require a higher level of servicing. HEPA filters can also be supplied to meet the needs of critical applications.